London, collection of Sir Joshua Reynolds (1723-1792; painter). 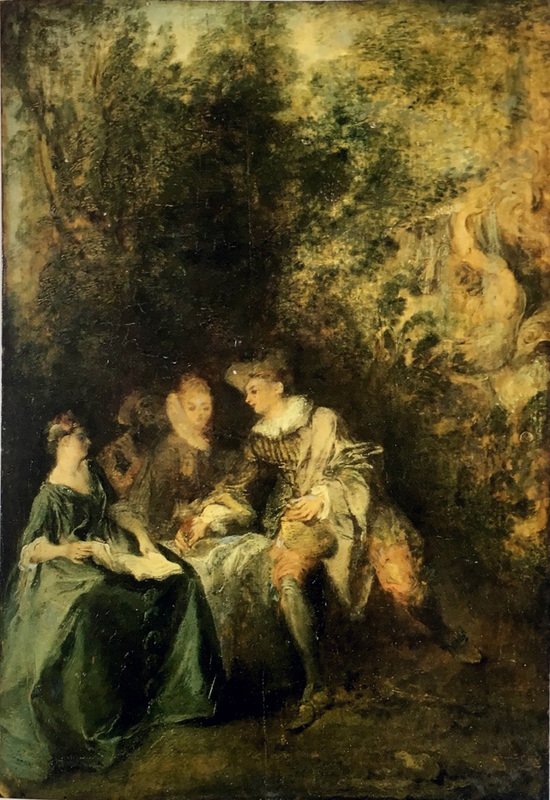 His sale, London, Christie’s, March 11-14, 1795, lot 83 (first day’s sale): “Watteau — A pair, a MASQUERADE AND A MUSICAL CONVERSATION, beautifully painted. The colouring exhibiting the brilliancy of the Venetian school; the pencilling is light, and admirably adapted to the subjects.” The pair of paintings sold for £19.19. London, collection of Andrew James (1793-c.1857; London corn merchant); by descent to his daughter Sarah. London, collection of Sarah Anne James (1829-c.1895). Her sale and others, London, Christie’s, June 20, 1891, lot 34: “A. Watteau. . . . A GARDEN SCENE, with four figures near a sculptured fountain / 12 in. by 8 in. From the Collection of Sir J. Reynolds.” According to an annotated copy of the catalogue in the Frick Art Reference Library, the painting sold for £525. Elsewhere the buyer is recorded as Wertheimer. Paris, collection of Gustave Mühlbacher (1834-1906; carriage maker). His sale, Paris, Galerie Georges Petit, May 13-15, 1907, lot 59: “WATTEAU (Antoine) . . . La Collation. Dans un parc, près d’une fontaine formée d’un dieu marin soutenant une coquille, quatre personnages assis sur un tertre. Une jeune femme en robe de soie verte tient une partition sur ses genoux; un jeune homme, coiffé d’un tricorne de paille, en veste rayée, culotte rouge en partie couvert d’un manteau de soie gris, tenant à la main une bouteille entourée de paille, lui offre un verre de vin. Une autre jeune femme, dont la tête s’encadre d’un large collerette, est au second plan, devant un musicien jouant de la flute. Bois. Haut., 30 cent. ; larg., 20 cent. Cadre ancien, en bois sculpté et doré du temps de Louis XV.” According to an annotated copy of the sale catalogue in the Frick Art Reference Library, the painting sold for 30,400 francs to “Ducrey” [Ducrocq?]. London, Royal Academy, Old Masters (1871), cat. 129 (as by Watteau, A Garden Scene, lent by Miss James). Ferré, Watteau (1972), 3: cat. P 92. Originally, as seen in the Reynolds and Coxe sales, there was a pendant painting but that work has not yet been identified. Likewise, the pendants’ provenance in the eighteenth century has not yet been traced, neither in France nor in England. Quite possibly they were attributed to Nicolas Lancret and then, probably by the time they crossed the Channel, their attribution was upgraded to Watteau. La Collation passed comfortably under the name of Watteau from at least the late eighteenth century, when it was in the Reynolds collection, through the middle of the twentieth century. Yet it should have been recognized as a work by Lancret since it is so evidently in his style. The painting is in an extremely poor state of conservation. It suffers from the loss of the central woman and almost all the background, and there is probably a great deal of repainting in the principal figure. However, Lancret’s hand is evident in the angular facial types, the awkward pose of the man at the right, and the fountain in the style of Gilles Marie Oppenord. It is surprising that Wildenstein did not list the picture in his 1924 monograph on Lancret, even though it was a well-known work in Paris, and had figured prominently in the Hulbacher sale some seventeen years earlier. Although Ferré rightly excluded it from Watteau’s oeuvre, even he did not ascribe it to any specific artist. Not until 1998, when it was sold from the Renand collection, was Lancret’s name finally attached.